Last week I asked you whether true random colour choices are really possible. After the week of intensive market research (can you tell I’ve been watching The Apprentice?) I have come to the conclusion that most crocheters like their colour choices to appear random, but we plan it that way. Thank you to everyone who commented and helped me realise that I’m not the only one who can’t do random. 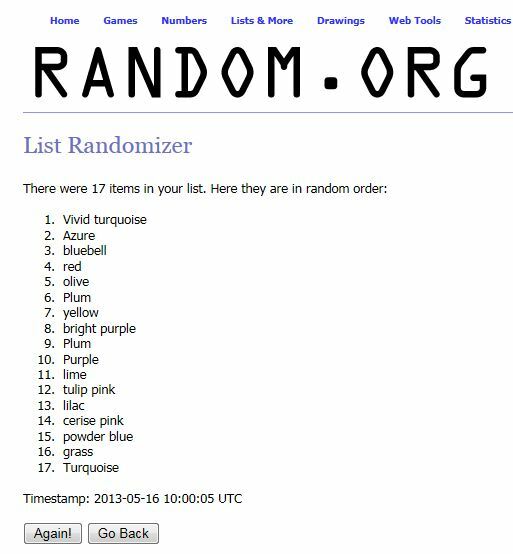 Planning randomness? Is it possible or is it an urban hookers myth? Well, fellow crocheters, random colour placing can be planned for! Our solution comes from the first comment on last week’s blogpost. The comment is made by “Boeta”. “Boeta” is an Afrikaans word for brother. My dear brother provided me, and therefore you, with the key to our success. Crochet blankets, motifs, granny square rounds, can be arranged and/or crocheted in a random way! The secret is using the list function on the www.random.org website. Seriously people. There is a website specifically for all things random. It really is as easy as that. I however went a bit further and added an Excel spreadsheet element to our colour choosing plan. I have been using a version of this Excel plan for Nicole’s granny square blanket, but as I told you last week it didn’t work out as randomly as I had hoped. With the help of random.org I was able to modify my plan specifically for use in creating granny squares. 3. 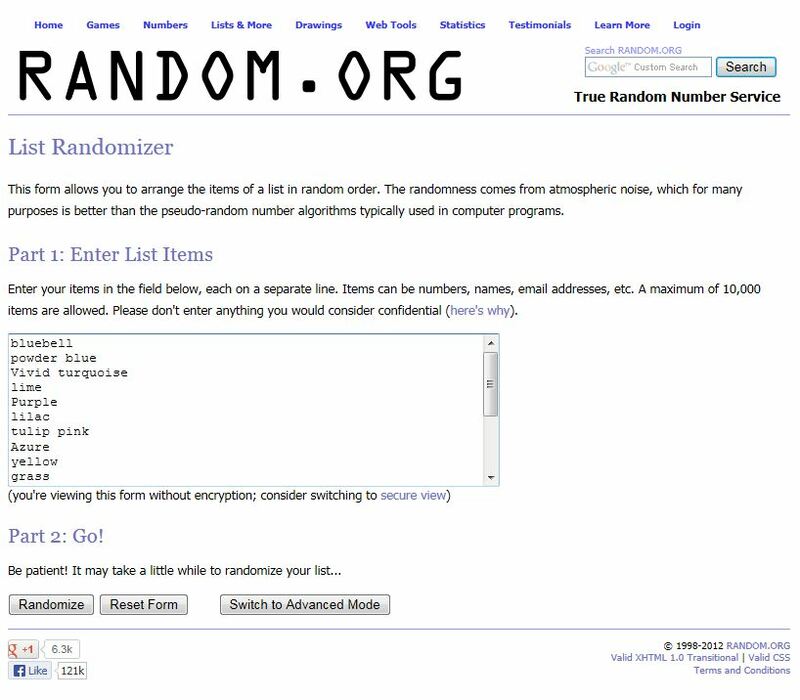 Go back to your list on random.org and hit the “Randomize” button, which will sort your list of colours randomly! 4. Copy the random list and paste it in your Excel spreadsheet underneath the first list. 5. Keep on going back to http://www.random.org and clicking on “Randomize” until you reach however many granny squares you have to make. I’m making 70 granny squares, so I will keep on pasting the list from www.random.org under Row 1 until I get to 70. 6. Continue pasting the random colours in the Row 2, Row 3, Row 4, Row 5 etc. columns. And that’s it. 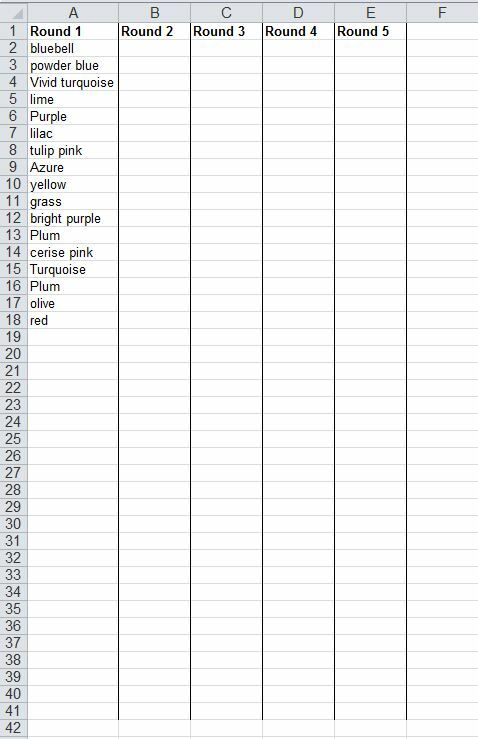 Just keep filling in the columns with the list of colours from random.org!! Easy peasy!! Tip 1: Look at your collection of yarn and find the colour that really stands out. The one that catches your eye first. In my selection of 17 colours, it was the red. I don’t want red to appear too many times, or as the last round of too many of my granny squares as it would overpower the overall look. To get around this in the planning stages, fill the cell where your stand-out colour appears, with that colour. To be on the safe side, I filled the yellow and red cells. It looks evenly spread out enough for me, so I’m sticking with this. Tip 2: Check that the colour next to your stand-out colour is not the same colour every time. In row 64 and 71 there is a lilac next to the red, but I’m okay with that as the other colours for that granny square are so different, you probably won’t even notice it amongst the 68 other granny squares. Another tip is to crochet the colours in reverse order. In the photo below you can see that I have the exact same colours, I just worked the five colours from my Excel sheet from left to right and then from right to left. This means that each row in your Excel sheet, can be used for two granny squares! 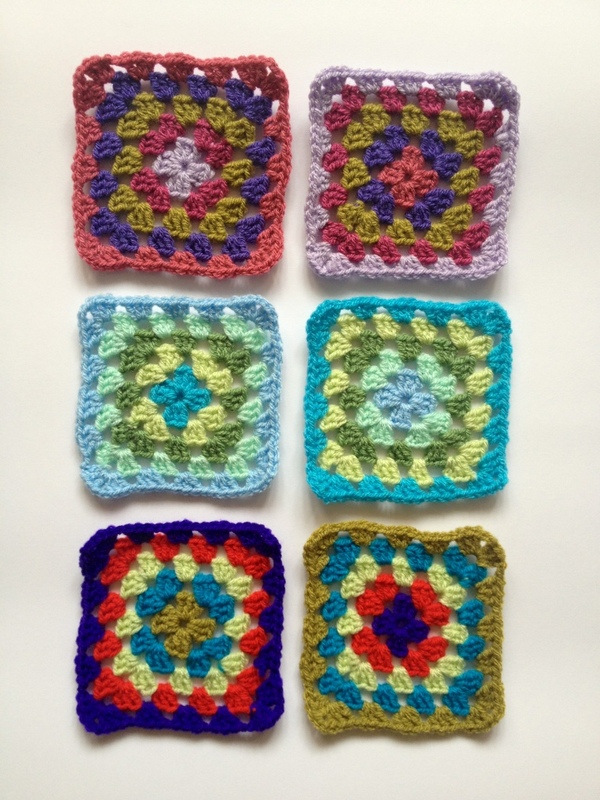 Having all your granny squares planned out in advance like this is very, very, handy. On a big granny square blanket project, you may not need to plan like this because duplications will get lost in the overall look, but for smaller projects, I think planning your granny square colour sequence in advance will be very helpful. We don’t want a repeat of the Pink Situation like I had with my first granny square cushion! Use this method for any crocheted items made up of rounds (like granny squares, hexagons or African Flowers). For arranging single colour squares in a blanket, think of each cell as a completed square and you have the colour layout of your whole blanket done and dusted! If you are crocheting stripes, use the random stripe generator. 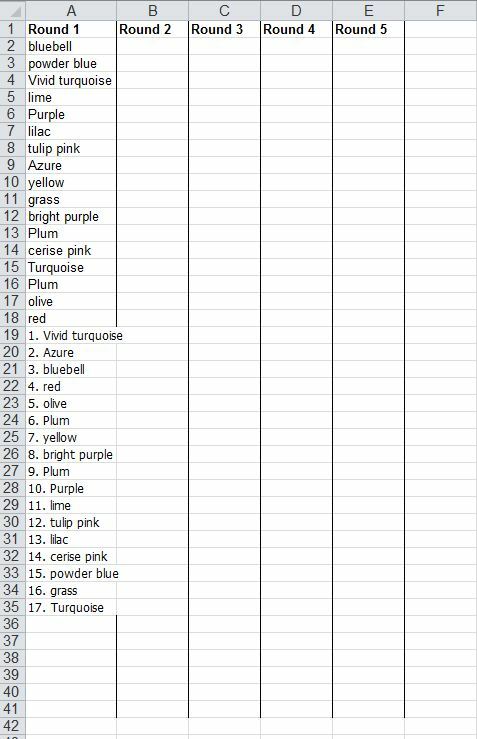 I hope you find this way of planning your random colour choices helpful. Are you a randomness planner? 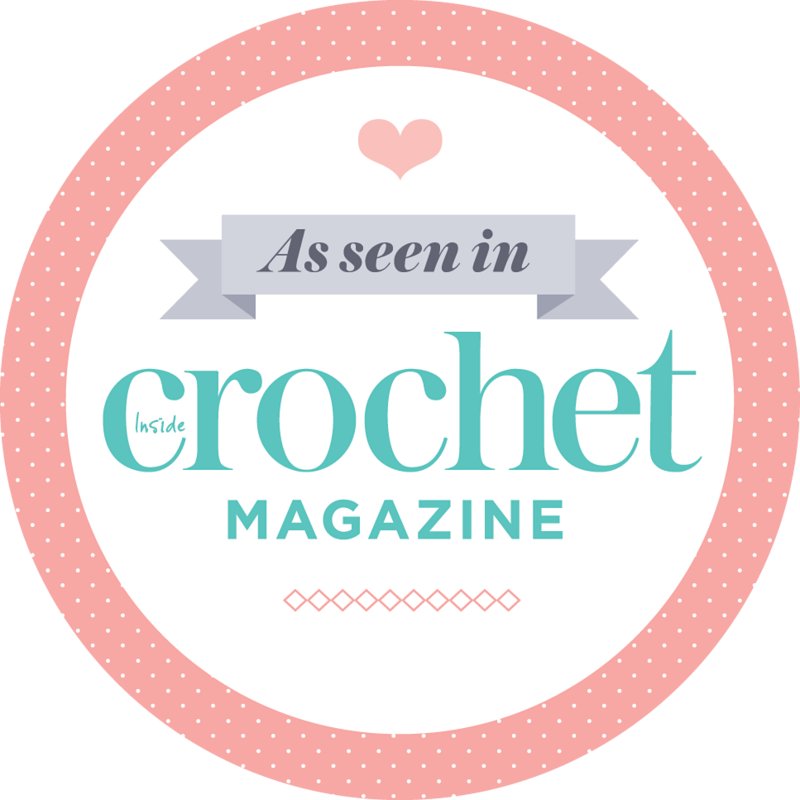 You go girl – you’re one creative crocheter! This is brilliant! I’m working on a granny square blanket and after each round I have to lay them all out and shuffle them – planning randomness at its finest! Fingers crossed this will mean I can spend more time on the crochet! I could hug you! I’ve spent two hours staring at my yarn balls trying to plan randomness. Thank you so so so much! Just discovered this post. Thank you!!! 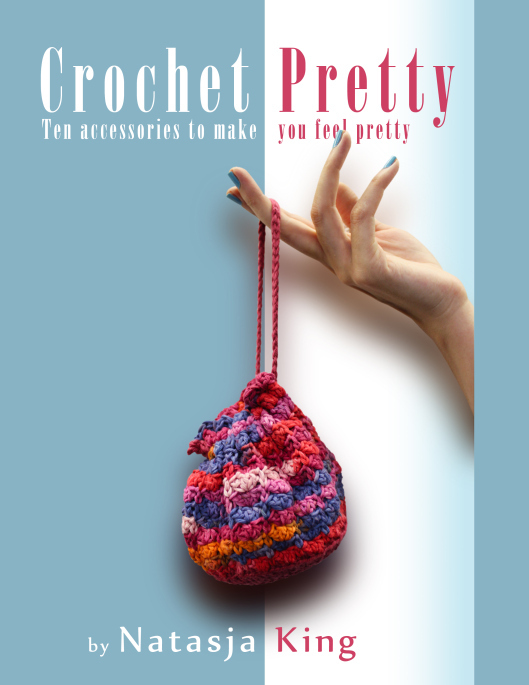 I’ve just joined my first crochet CAL and though the patterns are provided, the color choices are entirely up to me. This makes it so much easier. Thank you again!!! Good Lord! I am an avid knitter and I struggle with the crochet randomness of colors choices. I am so relieved that I am not the only one!! !